OMEGA™ Test Gauges are highly accurate gauges designed for use in instrument shops, plants of all types, and laboratories throughout industry. 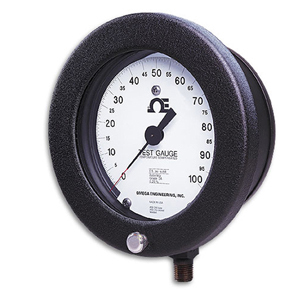 Performance, reliability, and precision measurement are coupled with consistent accuracy in meeting the demanding service needs of various test gauge applications, such as use as a master reference gauge, in test stand measurements, for production inspection, and for verifying the accuracy of general service gauges. The dial has a stainless steel mirror ring for pointer reflection to prevent parallax error. This mirror surface reflects the pointer in any position and allows the gauge to be read with great accuracy. The lightweight, friction adjustable balanced pointer with knife edge tip assures easy reading to the smallest subdivision. The accented dial graduations have a true width equivalent to 0.25% tolerance for quick and accurate gauge checking.